A rare treat, Chanel Chanel is a 61-minute documentary from 1986 featuring biographical information on Gabrielle Chanel’s background and rise to fashion fame and legend, but also lets Mademoiselle speak for herself. In an interview she must’ve given in the mid-1960s, Coco is as feisty as ever, talking about the details of her life and style. 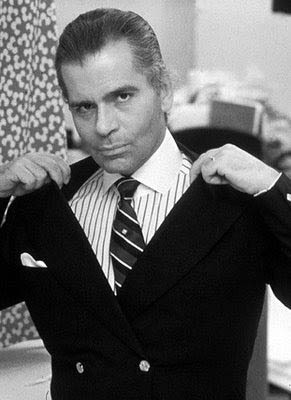 Another fascinating aspect is a younger Karl Lagerfeld, who would’ve only been three years into his role as Chanel’s creative director at the time the movie was made. He gives several interviews and shows the three huge collage books he made, with pictures of Coco’s designs in the 20s, 30s, and 50s. Karl Lagerfeld. He looks this young in the documentary. I was struck by how knowledgeable Lagerfeld is about fashion history. He really knows his stuff! At one point, looking at Chanel’s designs from the 1920s he says, “I could replace any of these dresses with Patou, Molyneux or Lanvin, no one would know the difference.” Wow! Chanel Chanel gives a quick and entertaining overview of the woman who built not only a company but a remarkable life. It also provides a glimpse of the man who has helped build Chanel the brand into a global powerhouse over the past 29 years. I found a copy of Chanel Chanel at the Brooklyn Public Library. Netflix does not have it yet, but it appears they are going to be getting it at some point, so save it to your queue! I highly recommend it. Looks like a great documentary. I find Coco fascinating and KL's not dull, that's for sure! I'll see if my library carries it but my guess is no....will wait for Netflix. I'll look for this at my library Karl is quite the interesting character too!! Good find. Thanks for the information, Jill! I will look for it...would love to see it! I am definitely interested if you recomend it. it sounds brilliant. OMG Karl Lagerfield is soooo young in this photo! Interesting about the long break giving rise to the more iconic Chanel designs. I'm running a swimwear and lingerie giveaway on my blog if you're interested! we don't have netflix in Australia, more's the pity. I love a young porky Karl. So much more sensible than crazy Karl frocked up in his gold party jacket in Lagerfeld Confidential. Thanks for reminding us this great documentary Jill ! I saw it on TV long ago - when I was living in France. Simply stunning. Coco Chanel was one strong character. So is Karl. He is the best of the best. Not only for his sumptuous creations but also for the way he understood Chanel's style right away. whoa, I was taken aback by the photo of the young Karl! I've not seen this film, but I think it was in my Netflix queue for a long time without ever surfacing. I would have to agree that she truly came into her own AFTER WW2. Thank you for the reminder of this documentary. Last night I watched Coco Avant Chanel. First time in the theater, I didn't like it but I downloaded it and loved the 2nd time around. In the final scene, she watches her collection come down her infamous stairway. She is younger but is wearing a white boucle suit so I guess the film didn't stay completely true to her bio. The film renewed by desire to wear more Chanel inspired clothes and wear my pearls more too. Will look for the documentary at my library. Thank you!